One of the reasons KidTown Melbourne exists is to showcase all the amazing things you can do with your children in Melbourne, so that you, too, can create forever memories as a family. That said, sometimes, memories can be made at home without spending much money or travelling far. All you need is a little creative thinking and initiative to drum up ideas to get your family involved in some fun adventures without leaving the house. 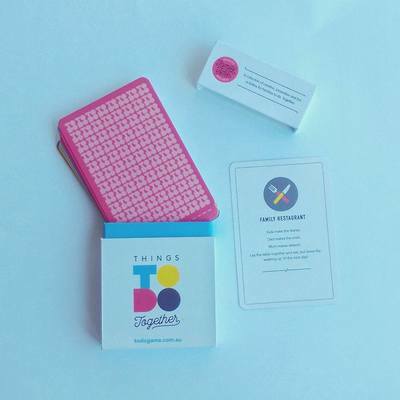 A new card game exists to help you on your way to create special memories with your family; The ToDo Game. 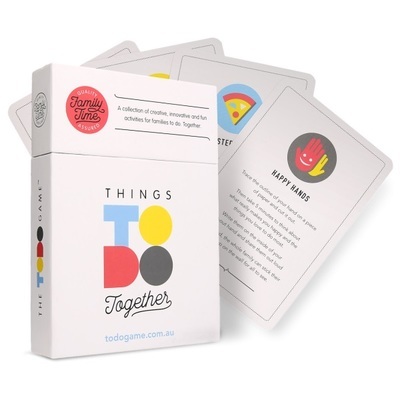 Developed by a Sydney family; Alexandra Drury, Dave Oswell and their 6 year old Freya, The ToDo Game helps families rediscover the elements of “together time” that, in this technological age, we often miss out on. The ToDo Game has no rules, and there are no dice or points, this is an activity to give your family a chance to spend time together without distraction, and enjoy some good old fashioned fun. So what's the deal, what do you do in The ToDo Game? Pick a card; any card, your children will love this part. On the card will be an activity you can do together as a family. Lay the table and eat but leave the washing up 'til the next day! Without giving too much away, this is just one of the many sweet ideas you can pull out of the 30 card deck. Some activities are indoor, some are outdoor, but most importantly, ideas give you the chance to connect as a family in a fun and interesting way. Suitable for all ages, but children from the age of 5 and up would get the most of out The ToDo Game.